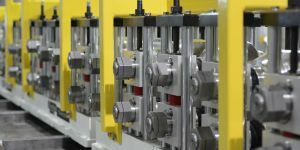 Metform has developed an industry unique and cost effective rafted tooling system for the roll forming industry. Since inception we have supplied thousands of the PS series stands to the industry. It is designed primarily as a rafted system with the intent to make a more accurate stand at a lower price. Our PS Series Stand offers robust and cost efficient solutions for our customers. The Metform modular PS rafted system allows you to effectively add new products to your roll forming line as you expand your business. It offers the flexibility to adapt to older mills with different drive and locating configurations. The PS raft is lighter, stronger and fully CNC machined with a reduced number of components. The end result is a more accurate stand system at a lower overall cost. 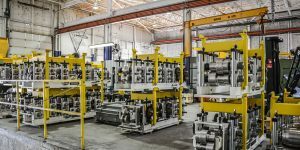 The flexibility generated from this truly modular rafted tooling system allows for simple nesting of passes and side roll fixtures. 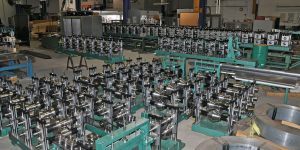 This process allows for more creative solutions when trying to solve specific bending challenges. 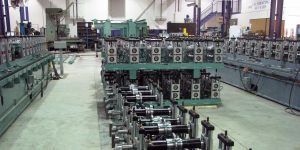 In addition, the mill set-up can be repeated resulting in faster tooling change and higher productivity. 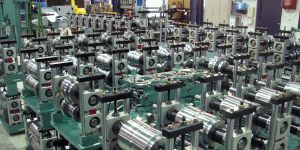 The PS Series Stands are available with shaft diameters from 1.5” to 4.5” with corresponding horizontal centers, vertical center adjustment and roll space. Metform offers an industry unique and fully modular stand design. High accuracy at a low price.